IBS or IBD – how can the doctor tell? Crohn’s Disease – Drugs or Diet? I’ve got a fistula – what is it and what are my options? Probiotics – so far so good! Preheat oven to 200°C. In a bowl mix all dry ingredients together and then add the oil and water. Transfer the dough to a lightly floured surface and knead for five minutes to form a dough which is soft and elastic. Place in a bowl and lightly oil the dough all over with a few drops of olive oil. Cover bowl with clingfilm and leave in a warm place to rise for one hour until doubled in size. After an hour place on a baking tray or shallow dish and use a small rolling pin to spread the dough to fill the tray/dish. Cover and leave to rise for a further 20 minutes. 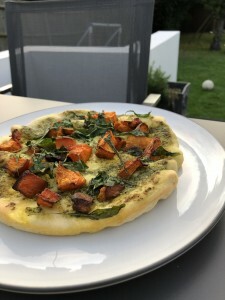 Then drizzle with few drops of olive oil and sprinkle with a pinch of rock salt and whichever topping you wish eg: rosemary, cooked sweet potato, cooked butternut squash, rocket leaves, cooked red onion, egg, pesto. Bake in oven for 6-10 minutes or until lightly brown. Jewish Digest shared a post. Check out this latest article about living with Inflammatory Bowel Disease (and lots of other fascinating articles!) in the latest edition of Aish UK Perspectives magazine, including a new simple soup recipe that you can make in 5 minutes! Thanks to Ari Kayser for helping us raise awareness! You can pick up the magazine free with the Jewish Weekly! The information on this site is for guidance only. It is not a substitute for professional medical care by a qualified doctor or other health care professional. Always check with your doctor if you have any concerns about your condition or treatment.